and make it extra rare, please. As this picture shows, everyone loves a Boomer Burger, at this classic drive-in in Bellingham. Wayne and I headed over to Boomer's Drive-in to get a burger, waffle fries and hard ice cream shake and here is what we saw in the next vehicle. Drive up to Boomer's, check out the menu and turn on your car's lights. The waitress will come to you to get your order and deliver it on a tray right to your car's window. Now that's a flash from the past. You can also eat indoors next to a warming fire. Obviously, this dog's human did just that. But that didn't deter this precocious pet from trying to get a burger of his own. One of our favorite places - it is fun and retro and the food is very good. If you get a chicken burger be sure you don't ask for extra lettuce - or you will float away in lettuce LOL. They already put plenty of lettuce on the bun, unlike some other places that give you a few shreds and pretend it is enough. We love the service - the atmosphere - and the food. It is often our grandson's choice too. Ha, ha... our dog was always first in the car and thought that her rightful place was behind the wheel! 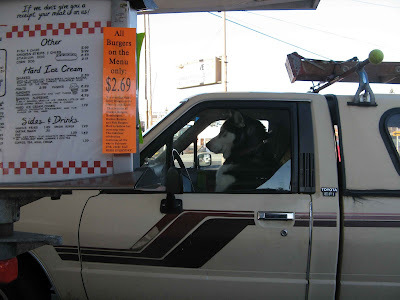 If the dog is smart enough to drive, he deserves his own burger. Darn straight, if the dog can drive he is entitled to a burger. That is a cute shot! I am sure the dog would love a burger! Thank you for linking up and sharing your post. Have a happy day!